I was contemplating today how different it is to make a raw meal then a cooked meal. For example, as a vegan, i ate a lot of black beans and rice, burrito, pasta, veggie burgers, soups, and smoothies. Even longer to prepare foods like homemade soups and homemade veggie burgers, there is the original chopping or mashing for 10 or 15 minutes, leave it to cook, then you have left overs for days. Now, everything is fresh. Oranges take peeling, smoothies take making, fruits take washing, veggies need chopping, smoothies need blending, ingredients need a run thru the food processor. There is no leaving the kitchen to do something else while the stove or microwave makes your dinner. Next day salad does not taste good to me. 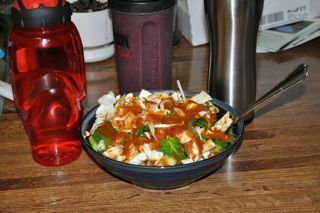 I have not found a way to really have left overs or really simple meals yet (it is something i am working on). If i want a simple meal, i eat 4 bananas. To me, fresh veggies, taste significantly better freshly chopped. A 2 day old chopped cucumber feels more plastic and flexible. Avocado does not keep well at all. I think this is where a big hit is coming from for me in terms of time. I used to spend an hour on the weekend and make a couple dishes for the week (usually a soup and something else), which meant i had lunch every day handled. Dinner took 10 minutes to prepare. Dishes took 5 minutes. I am still adjusting to the sheer amount of time this is taking. I dont know what to do yet to make this more workable. I feel like i end up eating alot of the same foods over and over again because i know i like them, and they get faster to make. I am going to spend more time this weekend attempting to fix this issue. Another difference is that raw is messy. My hands smell like food all day long. Chopping food every day (usually 3 times a day) messes a lot of cutting boards, creates alot of trash (non recycle trash unless you have a compost pile), gets your hands messy all the time, and is messier to eat. Is is messier then a 7 layer cheese burger? probably not. But it is much messier then the foods i typically eat. At first, i really enjoyed how much more textile eating became. Holding the cucumber with avocado and tomato on it and eating it like a sandwich instead of using a fork, holds nuts and seeds in my hand, holding fruit as i ate it. But all this is messy. Juice gets on your hands, avocado drips down, etc. It is hard to work while i eat because food squirts and gets places food should not get. As you can tell, i started finding some ways to solve this, like making the cucumber sandwiches into a salad of cucumber goodness. However, i still have orange peel under my finger nails. Long term, i need to so solve the time issue. I dont have 4 hours to spend in the kitchen every day and that is about what i am spending. On days i grocery shop, that amount of time i spend on food is even higher. While food is important, i dont have the time forever to spend this amount of time in the kitchen. The other issue one term is cost. I am doing more research on this in the next couple days and will write more about it then. I spent quite some time today brushing my teeth trying to get a blah feeling out of my mouth. It was like my mouth was fuzzy. I drank some extra water today to and that seemed to help. My weight went up .7 pounds putting total weight loss at 6.5 pounds. I finally got my nut milk bag in the mail yesterday and made juice this morning. I blended it i the blender then strained it thru the nut milk bag. I got less juice then i thought i would. Juicing also reminded me that i dislike drinks that are not water. I love water, and anything that flavors my water, i dont like, lemon, lime, coke syrup, and juice, i dont like. I was able to choke down my juice. Took me about an hour to get down 8 ounces. I am hoping my body enjoys the nutrients and my taste buds change. I then made myself one of those blueberry orange smoothies i keep making for mom, one taste, and to mom the smoothie went. blah. I dont care for blueberry, but i wanted to try it. 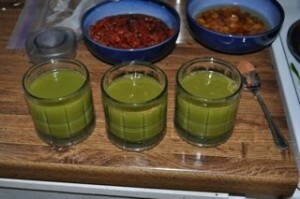 This juice i made is green apple, red apple, spinach, carrot, grapes, orange, and water. For lunch, i had an avocado, pear, plum, and banana. I did not even need to blend it all together. A little while later as a snack, i had another avocado. 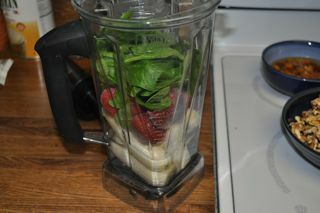 Dinner i had another strawberry, banana, spinach, maca smoothie. For dinner, my mom made herself a salad. I had made a red bell pepper dressing she really likes, so i she could make herself a salad when the mood stuck. Well, bed time for me, hope you enjoy Lindsay’s entry! Today’s entry will be short…I’m tired, emotional/stressed, and my focus is everywhere but here. I am finding that part of the problem of taking on so much is that when there is an effect, the cause is difficult to ascertain. How did the crazy person get through the woods? This entry was posted on Saturday, March 7th, 2009 at 3:40 am	and is filed under Raw Food. You can follow any responses to this entry through the RSS 2.0 feed. You can leave a response, or trackback from your own site.